Eggs (Mehcad Brooks) leans in over the bar to flirt with Tara (Rutina Wesley) in the upcoming season two of True Blood. 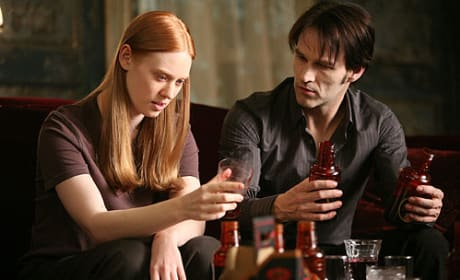 A picture of Bill (Stephen Moyer) and Jessica (Deborah Ann Woll) enjoying some synthetic blood together in this scene from the next season of True Blood. Seasoned waitress Arlene (Carrie Preston) talks to the new waitress, Daphne (Ashley Jones) in this scene from the sophomore season from True Blood. Sookie (Anna Paquin) and Bill (Stephen Moyer) seem to be having a very shocking conversation in this still from True Blood season two. Just look at Sookie's face!